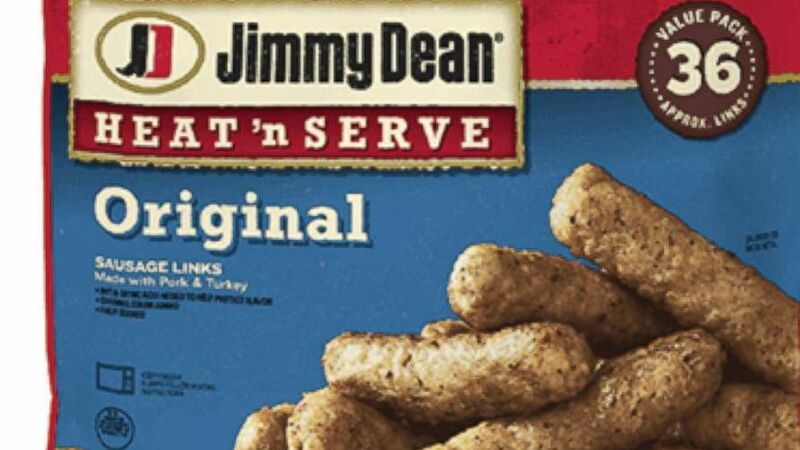 A company behind Jimmy Dean sausage has issued a voluntary recall of more than 29,000 pounds of product due to reports of “small, string-like fragments of metal” being found in the food. CTI Foods LLC, a co-manufacturer of the sausage, said on Monday that “a few consumers” had reached out to the company saying they’d found the metal in Jimmy Dean Heat ‘n Serve Original Sausage Links made with pork and turkey. The U.S. Department of Agriculture (USDA) said in its statement that there had been five consumer complaints of metal pieces in the links to the company. “Though the fragments have been found in a very limited number of packages… CTI is recalling 29,028 pounds of product,” CTI Foods said in a news release posted on the Jimmy Dean website. The Owingsville, Kentucky company said about 2,845 cases of the sausage had been made at one plant location on Aug. 4. Each package has the establishment code M19085 or P19085 as well as a “use by” date of Jan. 31, 2019 and the UPC number “0-77900-36519-5.” Cases containing the product bear the lot number A638216800 or A638216801, the company said. CTI Foods said that no injuries had been reported with the recall. The company urged consumers who found the product in their homes to remove the UPC and date code from the package, throw out the product and call 1-855-382-3101. “Jimmy Dean is closely monitoring this recall and working with CTI to assure proper coordination with the USDA,” CTI Foods said.